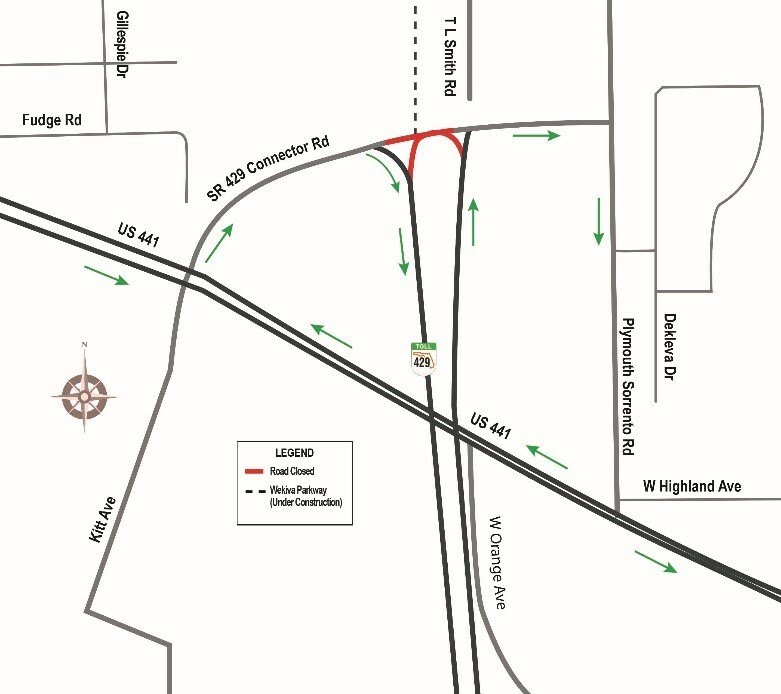 (APOPKA, FL) – Crews are scheduled Tuesday, October 3rd to close Connector Road to through traffic at State Road 429 (Daniel Webster Western Beltway). The closures scheduled from 9 p.m. - 6 a.m. are needed to finish building this part of the Wekiva Parkway (State Road 429). No through traffic will be allowed on the Connector Road at SR 429 during this operation. This work will require closing the SR 429 northbound left-turn lanes at the Connector Road. The SR 429 northbound right-turn lane onto the Connector Road will remain open to provide access to Plymouth Sorrento Road and US 441. Motorists on Plymouth Sorrento Road who wish to go south on SR 429 must turn right onto US 441, and then turn right onto the Connector Road to access the southbound SR 429 ramp.